When I look at this guy, I can't help but think of another certain six-mana 4/4 red and blue creature by the name of Niv-Mizzet. They both have an ability that cares about card-drawing along with an activated ability that lets you trigger it at will, and they will both take over a game if left unchecked. While Niv-Mizzet probably fits better in the more "vanilla" blue-red control or spells-matter style, the Locust God is a more unique ability (by the standards of blue-red) to build around and his ability to automatically return to your hand from the graveyard is at least as strong as it looks and perhaps better. The Locust God is basically a one-deity army generator. Izzet colors are good at drawing cards, and the effect of The Locust God guaranteed at least one bug each turn. It's kinda like a pricier, more-fragile Bitterblossom. 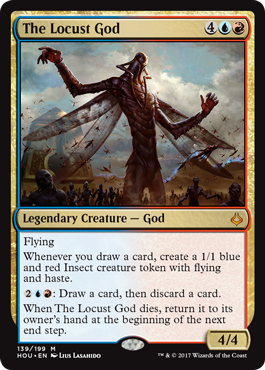 A six-mana 4/4 is pricey, even with flying, but The Locust God makes up for it by being a powerful card-advantage engine that synergizes well with the color pair's natural strengths. It can even loot for you if you need an extra creature or to get through more of the cards you don't need in your deck. And, of course, coming back once killed makes it a better threat, one that's pretty resilient in the face of removal.